With dental implants from Dr. Daniel Lauer, you can permanently replace missing teeth with results that look and feel natural. Dental implants are some of the most revolutionary advances in modern dentistry, eliminating many of the problems associated with other teeth replacement options, such as traditional dentures. A dental implant actually becomes part of your mouth, serving the same function as your natural tooth. This effective treatment option can ultimately improve the function of your teeth while enhancing the appearance of your smile. Dr. Lauer is a specialist in Implantology and has completed years of advanced training in these procedures, giving him the enhanced skills and experience necessary to provide the best possible outcomes. He utilizes some of the most advanced dental implant technology available, including state-of-the-art Guided Implant Surgery and precise digital mapping to give you the most natural-fitting implant possible. Our dental implant procedures can help you achieve your goals with exceptional results. 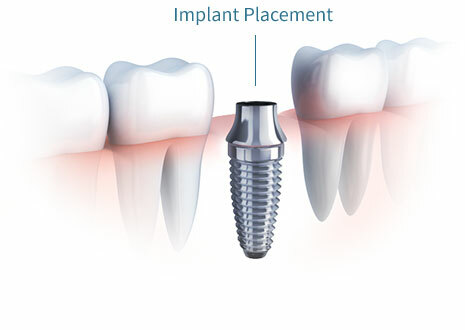 Please contact our practice to schedule a dental implant consultation with Dr. Lauer. He will be happy to answer all of your questions. Craig, a patient of Dr. Lauer’s, recounts his positive experiences at Precision Periodontics over the past 8 years. 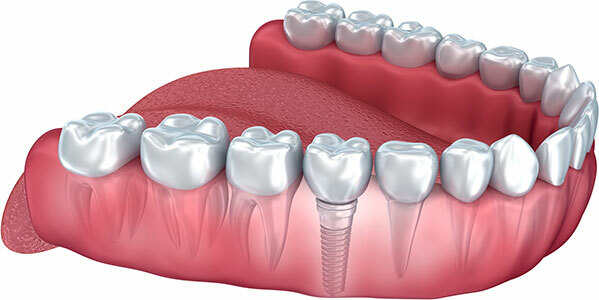 Dental implants can be used to replace a single tooth or multiple teeth. They can also be helpful for patients who would like to add support and stability to traditional bridges and dentures. There are a number of dental implant options that can help you meet your individual needs. For patients who may not completely meet the factors for candidacy listed above, there are alternatives to a full dental implant procedure which may be helpful, as well as treatments to potentially make them a good candidate, such as bone grafting and ridge augmentation. Dr. Lauer will go over all of your options at your initial consultation. What Types of Dental Implant Procedures Are Available? Dental implants can be customized to accommodate a variety of teeth replacement needs. Whether a patient is only missing one tooth or needs an entire arch replaced, Dr. Lauer is highly experienced in a number of dental implant techniques to provide the best possible outcome. Learn more below about the different types of dental implant procedures available. Patients needing to replace a single missing tooth can receive an individual dental implant for an incredibly lifelike result. For this procedure, Dr. Lauer will place the titanium post into the space where the tooth root once was. As this gradually fuses to your bone over a few months, it becomes a solid foundation for the restoration. Once your implant is securely a part of your mouth, a permanent dental crown will be attached to the post by your general dentist for a natural-looking and -functioning tooth replacement. 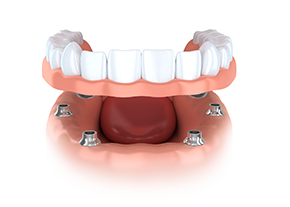 Implant-supported bridges can be used to replace multiple missing teeth next to each other. This procedure often involves placing two dental implants into the jaw, which will support a bridge of at least three replacement teeth. With an implant bridge, every single tooth does not need to have its own implant, but the teeth replacement still achieves a secure foundation. For those suffering from an entire arch of missing or severely damaged teeth, an implant-supported denture can provide life-changing results. A full mouth teeth replacement, often using the All-on-4® treatment concept, can replace one or both arches of teeth in a single day, restoring the form and function of a patient’s teeth without the inconveniences associated with removable dentures. 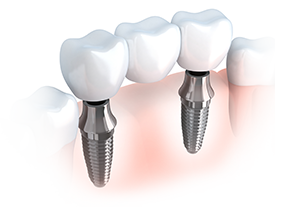 Dental implants are durable titanium artificial tooth roots that are connected to the jawbone. 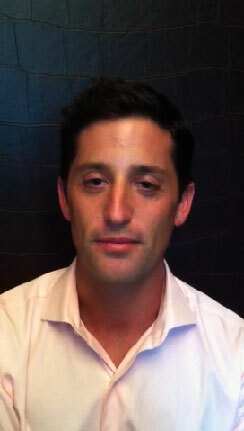 Dr. Lauer will place the implant inside the gum in the area of the missing tooth, and it will be anchored to the bone. Over the next few months, the implant will fuse itself to the bone – actually becoming a part of your mouth, like a natural tooth. During this process, a temporary crown can sometimes be placed on top of the implant for greater comfort and aesthetic improvement. Implant placement is typically performed with a local anesthetic applied to the treatment areas. You can also opt for one of our sedation dentistry techniques in order to feel as relaxed as possible during treatment. Dr. Lauer will examine the progress of the implant during the fusion process to determine when it is properly fused to the jawbone. Once this has occurred, and the area around the implant has healed, you are ready to be fitted for a permanent dental crown from your general dentist. 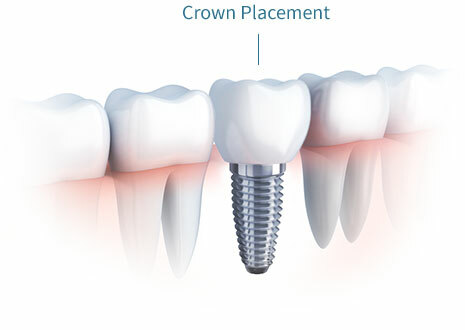 When your dental crown has been created, your dentist will attach it to the implant and the procedure will be complete. The permanent crown is custom-made to provide you with the most functionally and aesthetically perfect fit possible. The result? A brand new tooth (or set of teeth) that looks and feels like natural teeth. In fact, you may not be able to tell the difference between the implants and your actual teeth! When placed by a qualified professional and properly cared for by the patient, dental implants can last for decades, if not a lifetime. However, since restorations are more prone to wear and tear over the years, the artificial teeth may eventually need to be replaced. The average cost of dental implants is about $3,500-3,600, which includes the surgical placement of the implant post. To complete the entire dental implant process—from any preliminary work that is needed to placing the implant and final restoration—you can expect to pay about $3,500-5,000. More personalized details can be provided during your consultation, when Dr. Lauer has had the opportunity to perform an oral exam and begin planning the specifics of your procedure. Learn more about what factors into dental implant cost. Since insurance policies are typically designed to cover routine care, basic treatments, and emergencies, dental implants are often excluded as a covered benefit. However, the lowest-priced alternative to dental implants is often covered. Our staff can help patients navigate their insurance benefits to determine if their insurance provider will contribute to their total dental implants cost. In addition, to help make dental implants an affordable option for anyone, Precision Periodontics & Implant Dentistry offers dental financing options to divide the total cost into smaller, more manageable payments. Dental implants are considered one of the best options for replacing missing teeth, but we understand they are not always a realistic option for everyone. Alternative solutions that may be more appropriate for some patients include traditional dentures and bridges. For those who are not good candidates for several dental implants, Dr. Lauer may recommend a multi-tooth prosthesis that is anchored to the jawbone by approximately four to six strategically placed implants, such as in the implant denture procedure. During your consultation, Dr. Lauer will go over all of your options to ensure you are able to make an informed decision about your choice of teeth replacement. Why Should I Get a Single Tooth Implant vs. a Bridge? 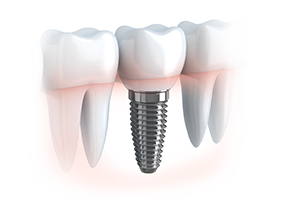 A dental implant to replace a single missing tooth holds a number of advantages over options such as dental bridges. In addition to acting as a natural tooth, a dental implant will not affect the health and structure of surrounding teeth and gums, and it will not require the grinding down of adjacent teeth. A dental implant can also better preserve bone, and it ultimately becomes a permanent part of your mouth, just like a natural tooth. Dental implants decrease the potential for receding gums around the new tooth; they are easier to keep clean; and they are more aesthetically pleasing than other treatment options. For some patients, an implant-supported bridge may be recommended. As a board-certified periodontist, Dr. Lauer is proficient in caring for the structures that support the teeth, and he only offers patients the safest solutions for their needs—dental implants being one of them. In fact, the dental implants used today have been around for over 30 years. The technology is the best it has ever been and continues to advance. When the procedure is performed by an experienced professional, and candidates are carefully chosen, dental implants are considered a safe replacement for missing teeth. Since implant posts are typically composed of titanium, a biocompatible material, patients can look forward to long-lasting benefits from their dental implants. If you have any questions about dental implants, such as the dental implant cost or which procedure is right for you, please contact Precision Periodontics & Implant Dentistry to schedule a consultation with Dr. Lauer.